Hello! 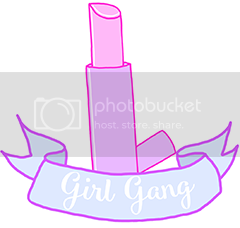 This is my first ever blog here, and I thought I would start by writing about what I'll be talking about most on this blog, cosmetics. I'll be writing this post from a historical point of view (as history is a big love of mine) I'll discuss the first ancient use of it, how cosmetics were used across the globe and how they came into the 20th century. I hope you like this post and any feedback and critique is well appreciated! The first use of cosmetics dates back to 100'000 years ago where it was first used as body art in Africa in the middle of the Stone Age. Archaeological evidence suggests cosmetics certainly go as far back as ancient Egypt and Greece, where the use of aromatic ointments and eye make up has been found in Egyptian tombs, dating back to 3500BC. By the first century, Egyptian, Roman, Greek and Middle Eastern countries developed cosmetics such as lead based powders to whiten the skin, kohl to darken the eyes and rouge for the cheeks. Nail polish also dates back to ancient Egypt, not for cosmetic use but for society classification, the rich wore red polish, the middle class wore black polish and the poor wore no polish at all. Ancient cosmetics were made from rosewater, beeswax, olive oil and castor oil. The women in ancient cultures who wore make up used cosmetics to seduce men by changing their appearance. Matrons, the leaders of prostitute rings were especially recognised by their silks and use of cosmetics. 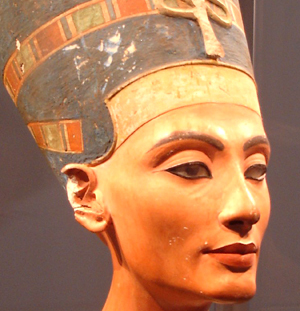 The bust of Nefertiti, wearing black eye make-up. In Japan, female entertainers known as Geishas wore lipstick made of crushed safflower petals, and used rice powder to colour their face white, and bird droppings were sometimes added to achieve a whiter complexion. Geishas also blackened their teeth with paint for special ceremonies. In Europe during the Middle Ages, church leaders condemned the use of cosmetics and thought it immoral to use cosmetics, but many women used cosmetics anyway. From the Renaissance to the 20th century, the lower class worked outside, which darkened their skin, whereas the higher a persons status was, the less time they spent outdoors, which kept their skin pale. Therefore, the paler a woman was, the higher up in society she was. Many lower class women attempted to lighten their skin by using powder to look more aristocratic. White lead paint was also used which contained arsenic and killed many women. In the 13th century, Italian women wore red lipstick to show they were upperclass, and during the 16th century, women bled themselves to achieve paler skin. In China, people stained their nails with egg white, gum arabic and gelatin around 3000BC, which represented social class, an idea they no doubt got from the ancient Egyptians. Royals wore gold and silver or black and red, the lower class were not allowed to stain their nails. Flowers also played an important role in decoration in China. An old legend says that while Princess Shouyang was resting under the eaves of a plum tree, a plum blossom drifted on to her face which left an imprint which enhanced her already beautiful looks even further. The women of the court noticed this and began decorating their own foreheads with plum blossoms. 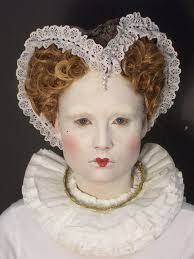 Pale faces were a fad in Europe during the 16th century. The use of cosmetics in the 20th century became very popular due to the influence of ballet, opera, the theatre and the movie industry, which was booming in Hollywood. In 1914, a Polish born American businessman, Max Factor developed a greasepaint foundation that wouldn't cake or crack. This became popular with film stars. Max Factor would go on to invent lipgloss and and eyebrow pencils. In the 1920's, he would begin to market his make up to the public, claiming they could look like their favourite movie stars. Flapper girls of the 1920's had a strong influence on cosmetics, which embraced red lips, dark eyes and suntan, which was popularized by none other than Gabrielle ''Coco'' Chanel. Innovations in cosmetics during the 1920's made it alot easier for women to experiment with make up, as cosmetics now came in smaller tubes and packaging. With the popularization of film, women could now look like the stars who embraced the flapper girl style, such as Clara Bow, Gilda Grey and Joan Crawford. 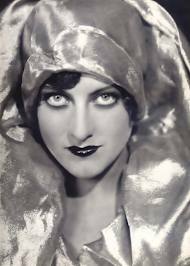 Before the '20's rouge, or blush, was messy and associated with promiscuous women. Blush now came in smaller pots and became socially acceptable. In the 1970's, natural looking makeup for the daytime and heavy sexualized make up for the nighttime became very popular. The punk movement in the late '70's brought with it an ''anti-beauty'' movement, aimed with not following the trend and embraced heavy make up, tattooing and piercing. Glam rockers such as David Bowie also brought another style known as glam, and bordered on androgyny. Glitter eye shadow and nail varnish became very popular in this trend. The seventies saw an increase of anti ageing products, waterproof mascara and smokey eyeshadow. Really enjoyed reading this! I don't usually take such an interest in cosmetics but, as you've said, the history behind these things is always fascinating! I absolutely loved all this info--I found some interesting facts of my own, many that you've mentioned here, in the Roman Mysteries books, and an ITV show "Mr. Selfridge", well worth checking out!